The OASE UST150/20m Underwater Transformer is supplied with 20 metres of 230v mains cable and is a genuine replacement part for the OASE Pond Jet Halogen Light Set. 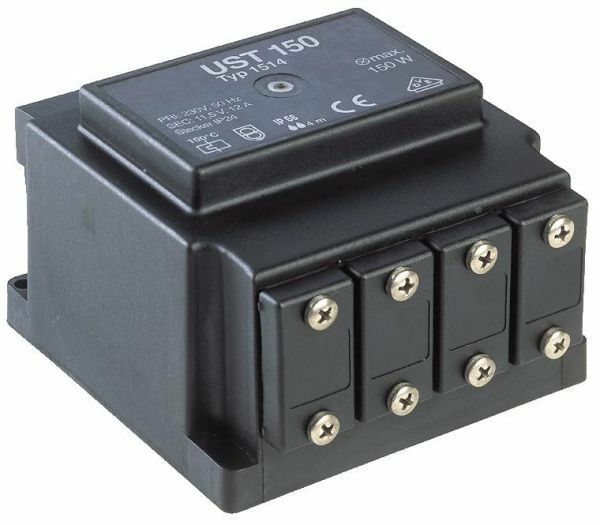 The UST150/20m Transfromer can also be used in conjunction with the OASE Lunaqua 10 Halogen and LED Lighting systems, offering an additional 10 metres mains cable length over the standard UST150 transformer, allowing for a great span between the wiring point and the transformer mounting point. The Transformer features IP68 rated watertight connection points for up to 4 x Lunaqua 10 spotlights and connecting cables. This transformer will power up to 150 watts of spotlight illumination and is pre-wired with 20 metres of 230v mains electrical cable for connection to a power source.